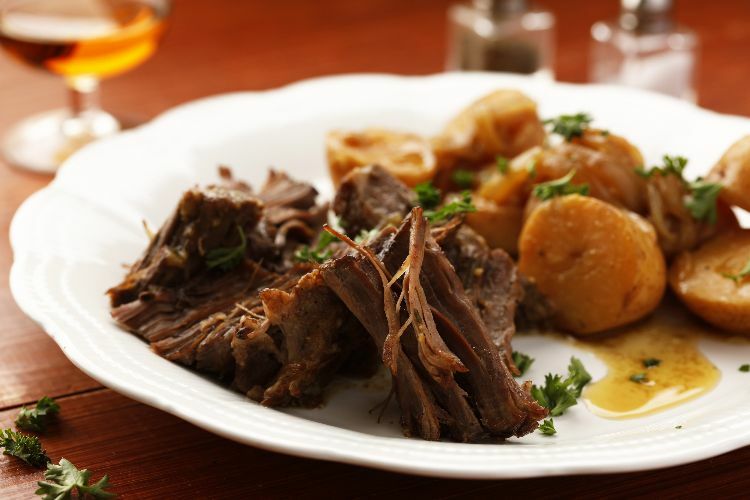 Pot roast is a quintessential Sunday night dinner. That doesn't mean, however, that Sunday nights have to be boring, with the same cut of meat served in the same way over and over again. Many people don't realize that pot roast can be customized, too. Different flavors can be added to the roast and to the pan to make it something completely different. That's just what happens in the recipe below. 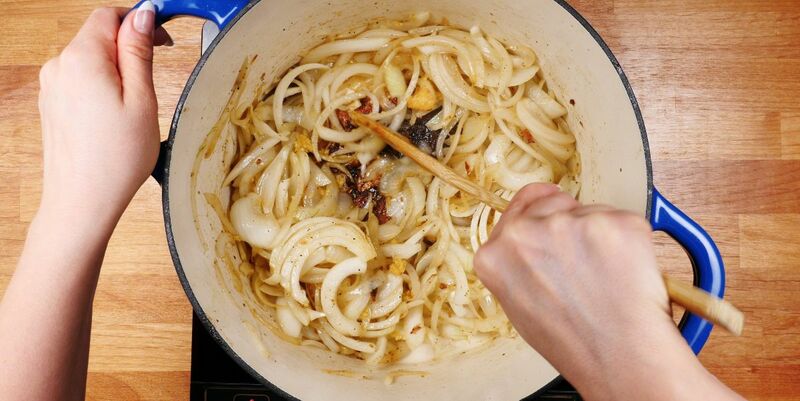 For this French onion pot roast, onions are first slowly caramelized to get that true, deep, French onion taste. Sherry is added, just as it is to French onion soup, with a couple of sprigs of thyme. The roast gets added back to the dish, and it cooks slowly in the oven as you enjoy a Sunday afternoon nap. If you want to make it even more like French onion soup, you can put the potatoes under the broiler with just a little bit of cheese on top, but it's delicious served as is. Preheat oven to 300 degrees F. Pat roast dry with paper towels. Preheat a large Dutch oven or other large oven-proof pot over medium-high heat. Add 2 tablespoons of oil and, when hot, add roast and season generously with salt and pepper. Dust the roast with flour. Sear the roast on all sides until it becomes nice and brown and starts to develop a crust. Remove from pot and set aside on a plate. Reduce heat under pot to medium low. Add 2 more tablespoons of olive oil to the pot and add onions. Stir them regularly and continue to cook for up to 30 minutes, until they start softening and becoming golden brown. Add garlic and sauté for another 2 minutes. Increase heat in pan to medium high and add the sherry. Allow it to come to a boil and scrape up any browned bits from the bottom of the pan as it does. Add the beef broth and Worcestershire sauce and season lightly with salt and pepper. Add the roast back into the pan and place potatoes all around it. Add the thyme sprigs, snuggling it into potatoes and in the liquid. Bring everything to a simmer. Cover the Dutch oven with a lid or foil and place in the oven for 3 hours, or until beef can be easily shredded with a fork. When ready to serve, slice or shred beef and serve on a large platter with potatoes and onions, pouring some of the juice over the top.